+ What is New England Clean Energy Connect (NECEC)? New England Clean Energy Connect (NECEC) is a clean energy transmission project proposed by Central Maine Power (CMP) in conjunction with Hydro-Québec Energy Services (US). The project is capable of delivering up to 1,200 megawatts (MW) of renewable energy – hydroelectric power or a combination of hydroelectric power and wind power – from Canada to the New England power grid. + How will the renewable energy be transmitted into the grid? The proposed project consists of 145 miles of new High Voltage Direct Current (HVDC) transmission line that will tie into the existing transmission system. Additional project components include upgrading 50 miles of existing alternating current (AC) transmission lines, construction of a new converter station, a new substation and multiple system upgrades. + Where is NECEC located? All of the U.S. project components will be located in western and southwestern Maine. A new HVDC transmission line will come into the U.S. at the Canadian border in Beattie Township, Maine and run through working forest for 53 miles before it merges with an existing CMP-owned transmission line right-of-way (ROW) in The Forks, Maine, for 94 miles. A new DC/AC converter substation will be located in Lewiston, Maine, and a new 345 kilovolt (kV) substation will be located in Pownal, Maine. + What is the timeline for NECEC? Construction is anticipated to begin in late 2019, with the project completed and in service by 2022. + Who owns the land where the transmission line and substations will be constructed? Central Maine Power has completed acquisition of a corridor from the Canadian border into the U.S. electric grid in Maine. CMP owns and controls the 145-mile transmission corridor where the new transmission line will be located, as well as the land in Lewiston where the new DC/AC converter substation will be constructed, and the land in Pownal – the location of the new 345 kV substation. + How wide is the new transmission corridor that begins in Beattie Township? The 53 miles of new transmission corridor or right-of-way (ROW) will be 150 feet of cleared width, with an additional 150 feet that remains undeveloped. + What will need to be done to the existing ROW to accommodate the new HVDC transmission line? The corridors where the HVDC line will be co-located with existing CMP transmission lines are 300 feet to 500 feet wide with 150 feet or more currently cleared for the existing lines. On average an additional 75’ will be cleared for the new line. Co-locating in existing corridors minimizes new clearing requirements and provides more options for the location of construction roads and support activities. + How many new transmission structures are needed for the HVDC line? What will the structures look like? 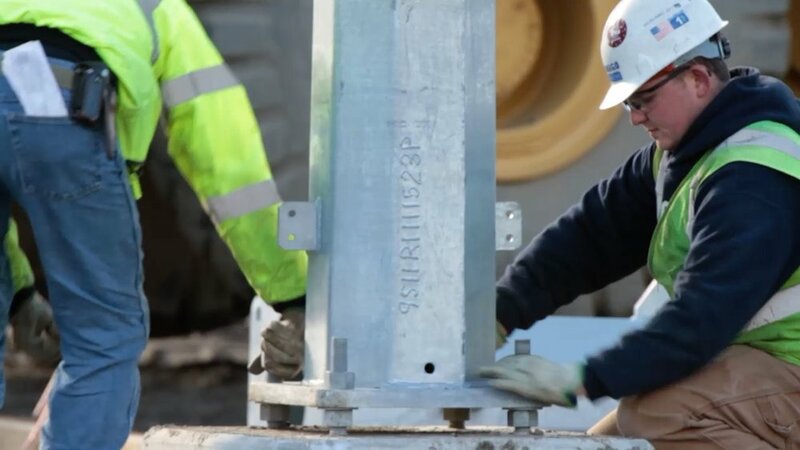 The new line will be supported on approximately 850 weathering steel monopoles, although a two-pole structure will be used in certain situations. The average height of the poles is 95 feet above ground. + What upgrades will be done to CMP’s existing transmission line? The most significant upgrade is 26.5 miles of new 345 kV transmission line in an existing corridor between the Coopers Mills substation in Windsor, Maine, and the Maine Yankee substation in Wiscasset, Maine. Additional upgrades are planned in Pownal, Sabbatus and Lewiston. + What permits are required for this project? + Will NECEC require local permits? Yes, some local municipal approvals are required for construction of project components such as substations and transmission structures. The exact type and number of permits will vary, depending on the location. + How long will the permitting process take? The permitting process began in 2017 and is expected to be completed by the end of 2019. + How will the construction of the new transmission line and substations affect the environment? Biologists have evaluated impacts to wetlands, wildlife and other ecosystem features. This information has been compiled as part of the state and federal permit applications, and all environmental standards will be met or exceeded. The project has been designed to minimize environmental impacts through careful siting and to mitigate for impacts that cannot be avoided, consistent with CMP’s commitment to environmental stewardship. Total permanent wetland fill – primarily at the substation site in Lewiston – is less than five acres. CMP will contribute to the State’s wetland mitigation bank administered by The Nature Conservancy. + How much additional land within the existing corridor will the NECEC clear? CMP’s existing transmission corridor from The Forks to Lewiston will provide the route for the new high voltage direct current (HVDC) transmission line, which will be co-located with one or more existing transmission lines. This corridor varies in width from 300 to 500 feet. The corridor is currently cleared to a minimum of 150 feet in width to accommodate the existing transmission lines. Large segments of the existing corridors will require no additional clearing. In segments that will be cleared, it will require on average an additional 75 feet to make room for the new line. Co-locating in an existing corridor minimizes new clearing requirements and provides more options for the location of construction roads and support activities. + How much forest in the Western Maine corridor will the NECEC clear? More than 70% of the line will be in existing, active utility corridors. The new corridor section crosses through a large area of commercial woodlands laced with roadways and active areas of timber harvesting and forest management. Only 150-feet of the new transmission corridor or right-of-way (ROW) will be cleared of trees, the remaining 150 feet will remain forestland. The total cleared area, 964 acres, will be maintained as scrub-shrub vegetation, which provides beneficial and under-represented habitat for a variety of species. The new corridor was deliberately located where the use would be compatible with commercial forest management and timber harvesting. According to the Maine Forest Service, Maine woodland owners harvested an average of 411,000 acres per year for the past ten years, supporting logging and the forest products industry. The proposed corridor would represent two-tenths of one percent of the annual average. + How will this project reduce greenhouse gas emissions? 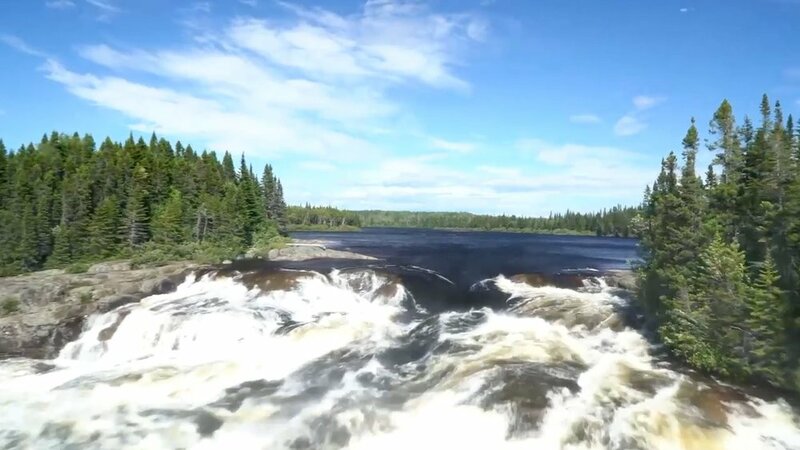 Hydro Quebec has stated that the energy will come from its existing hydropower generation facilities, as they will be expanded over the next several years. 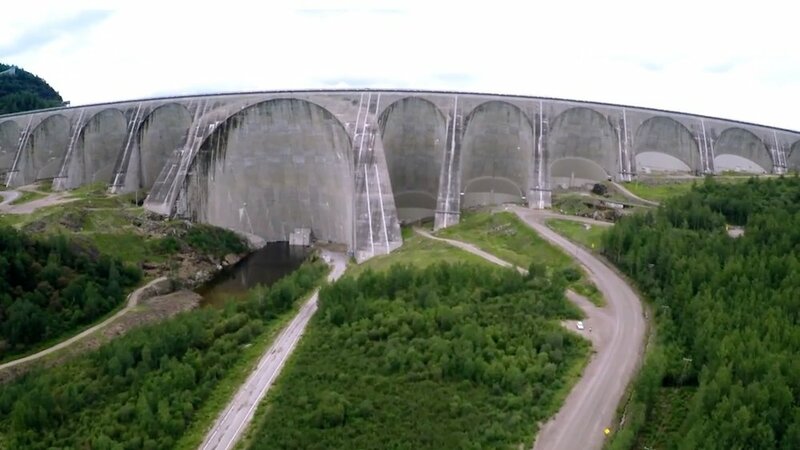 Using these facilities and the energy it has stored in its reservoirs, Hydro Quebec plans to deliver the 9.45-terawatt hours of NECEC enabled clean energy on top of the energy Hydro Quebec has historically sold into New England and the rest of the northeast region. The net effect of the Massachusetts procurement is that GHG in the region will be reduced. Even should Hydro Quebec not be able to provide the NECEC enabled energy on a completely incremental basis, any reduction in Hydro Quebec energy sales elsewhere in the northeast are not expected to result in increased GHG emissions overall. All the New England states and Northeast Canada have either renewable portfolio standards (RPS) or greenhouse gas (GHG) reduction targets that will drive the development of alternative clean energy resources, which will replace reduced Hydro Quebec hydropower with another renewable. In fact, the energy market consultant to the Maine Public Utilities Commission has testified that, while it is theoretically possible that the energy flow on NECEC would be redirected from sales that would have been made in other markets/regions, there are several reasons why the emissions increase in other regions may not be substantial (if there is any at all). Quebec's two other export destinations are Upstate New York and Ontario. In New York specifically, the generation supply mix is primarily zero emitting – existing large hydro, wind and nuclear. Moreover, New York State has the Clean Energy Standard, which dictates that 50% of load needs to be served by renewable resources by 2030. Most new renewables will be built Upstate. So even if any power is diverted from Upstate NY, it will likely be replaced by existing or new renewable resources. Therefore, this should not result in increased GHG emissions in New York. In Ontario, there is currently excess baseload generation, which even requires the reduction of nuclear output from time to time. Hydro Quebec's power being diverted from Ontario could potentially be replaced by increased nuclear production, or other renewables, so the net impact on GHG reductions will be positive. + How will NECEC impact other renewable energy sources like wind power? Additional baseload power such as that provided by NECEC is essential if new renewables are to be integrated into the electric grid. The ongoing retirement of fossil fuel and nuclear-powered generation plants in New England could result in a loss of 10,000 MW of power from the grid over the next decade. NECEC will replace 12% of the conventional capacity the region is losing with clean hydropower. + What does Maine stand to gain if all the power is sent to Massachusetts? Massachusetts is paying for a project that will benefit every state in New England in proportion to their share of the regional electric demand. NECEC will harness Canadian hydropower and transmit clean energy into the New England electric grid, which connects all six New England states. The new HVDC line enters the electric grid in Lewiston, Maine, one of the strongest connection points in the power system, so this electricity will serve load in Maine. Also, Maine and the other New England states will benefit from the subsequent price suppression in electrical rates and the reduction in greenhouse gas emissions from this new source of renewable power. Maine will also benefit from the creation of thousands of jobs during permitting and construction, new local tax revenue, increased gross domestic product (GDP) and cleaner air. + Who will pay for the project? Massachusetts electric customers will pay for the entire project, per legislation passed by Massachusetts lawmakers in 2015. + Will this project raise electricity rates? No, in fact New England electric customers will experience a decrease in wholesale electric rates. + How will this impact electricity rates? Bringing this much lower-cost hydropower to New England will displace higher cost energy sources, such as inefficient fossil-fuel based power plants, therefore driving wholesale prices down.